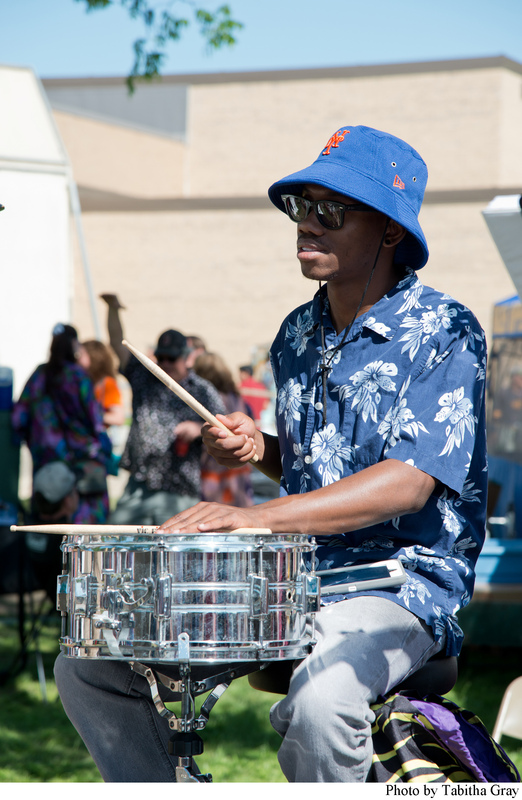 Community members celebrate Denton’s annual Arts and Jazz festival in their own way. The Denton Arts and Jazz Festival is a three-day weekend tradition for people living in the North Texas area. 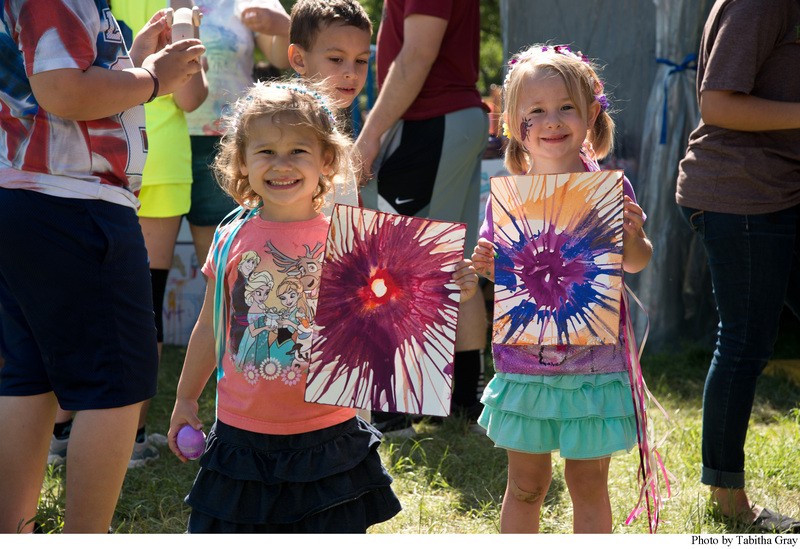 For community members of all ages, the festival is a family-friendly event inclusive to a variety of interests. Despite the random downpour of dime- to quarter-sized hail that erupted from the sky about 5 p.m. the first day of the festival, community members and visitors trickled in. Traffic picked up later in the evening around 7 p.m., when the UNT 1 O’Clock Lab Band began playing on the Jazz Stage. Even two hours later, people were still wading in mud trails created by the earlier squall to get to opposite sides of Quakertown Park. Throughout the weekend, Discover Denton hosted the information booth, passing out flyers for the event and inviting festival-goers to play a game to win a prize of Discover Denton swag. Discover Denton Representative Katherine Jeffcoat was on-staff and working the booth Friday night. Jeffcoat shared that Discover Denton will be opening a welcome center on the Square over by LSA Burger later in May. The welcome center will also house the Denton radio station, where visitors can see the broadcasters on-air through an open format studio. Among the 3,000 individual performers at the event were 300 different artists and vendors selling their pieces at the festival. One couple, Cindy and Larry Hague, travelled from their home base in South Dakota all the way to Denton to be a part of the Arts & Jazz Festival. The Hagues are both artisans; Cindy has, since retiring, picked up jewelry making and knitting while Larry uses several techniques of molding, carving and welding to create functional pieces of art. Larry shared that he started carving as a kind of therapeutic activity during a difficult time in his life. They both recently retired and decided to buy an RV to travel, visit family and stop at different festivals to sell their artwork. Larry joked: “It’s like living in a tiny car, kind of.” Larry has a flair for carving and molding unique characters – his works are certainly one of a kind. The Hagues sell a variety of knit hats, jewelry pieces, ceramic magnets and household items. Connie Lane represented Impressions, a store on the south side of the Square with a variety of glazed ceramics. Lane explained that Impressions is a part of the vocational program at Denton State Supported Living Center. Other vendors were selling food, like the Perry family from Wylie. They own Papa Perry’s Pepper Products, a tongue twister in itself, which preserves and sells sweet and spicy jellies and sauces. Another vendor, Savannah Kurka, recently graduated from UNT and has since launched her own business. She creates wood and fiber household and jewelry products, as well as using laser cutting to create paper products. Kurka described her interest in combining modern and traditional craft in her work, which is how Savvie Studio was born. Whether people came for the art, the music or both, the whole day was filled with creative people sharing what they loved with the world. Part of what makes Denton, Denton, is community support for local events, artists and musicians. People showed this weekend that appreciation of the arts tops all for this town.